New SignaLinkTM Plug & Play Jumper Modules! New jumper modules are now available for most Alinco, Icom, Kenwood, and Yaesu RJ-45 and RJ-11 Mic connections. New jumper modules are also now available for most Icom, Kenwood, Ten-Tec and Yaesu 4-pin round Mic connections. 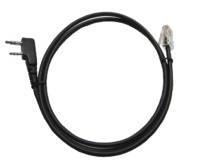 New SignaLinkTM radio cables for Baofeng, Wouxun, Yaesu, and Kenwood HTs! New SignaLink radio cables are now available for a wide variety of popular HTs including the Yaesu FT-50R, FT-60R, FT-270R, VX-6R, VX-7R and VX-8GR, Baofeng GT-3 and UV-5R, Wouxun KG-UV6, Kenwood TH-F6A and TH-F7E, and many others. See the "Extra Radio Cables" section of our web store to purchase the cable only, or the "SignaLink USB" section to purchase the cable with a SignaLink USB. Please note that we currently have only our SignaLink USB and SignaLink accessories available for purchase online. If you would like to place an order for a different product, then please contact our Sales Staff by telephone to complete the order. When placing your order here, you can create an account, or shop as a guest. Either way, your shopping cart will be active until you leave the store. To get started, please select the product you are interested in from the menu on the left. If you have any sales related questions, such as which radio cable you will need for your radio, then please feel free to contact our Sales Staff by telephone at (800) 822-9722 / (541) 474-6700. They are available Monday through Friday, from 9AM to 5PM PST / 12PM to 8PM EST. You can also submit any questions through our Contact Form. Thank you!